distribution Essentially statewide, though likely scarce at middle elevations and perhaps absent at higher elevations in the mountains. Occurs throughout the Piedmont and Coastal Plain, including counties along the coast. abundance Fairly common to occasionally common in the southern half of the Coastal Plain; uncommon to locally fairly common in the northern Coastal Plain and in the lower Piedmont; uncommon in the remainder of the Piedmont and lower mountains; scarce at higher elevations. Abundance is quite at odds with Dunkle (2000) for its entire range, and Beaton (2007) for GA, both which indicate "uncommon". Perhaps the species is more numerous in NC than in most other states. Seldom occurs in large numbers on a given day, but quite widespread, at least in much of the Coastal Plain. flight Very late March or early April to mid-September, and rarely to early October, in the Coastal Plain and Piedmont; however, not numerous after late July. In the mountains, the flight occurs from late April to mid-September, but is scarce after mid-summer. habitat Marshes, bogs or boggy areas, grassy ponds, and other pools; favors semi-wooded areas. behavior Less likely to spend much time around ponds, pools, and marshes than most other skimmers. Instead, adults are typically seen foraging well away from water (thus not making it clear what might be the breeding habitat), often in fields, savannas, powerline clearings, and woodland borders. They often perch conspicuously on tips of twigs or grass stems. comments This skimmer seldom occurs in swarms, but is often seen daily, at least in the southern Coastal Plain in the first part of the flight season. 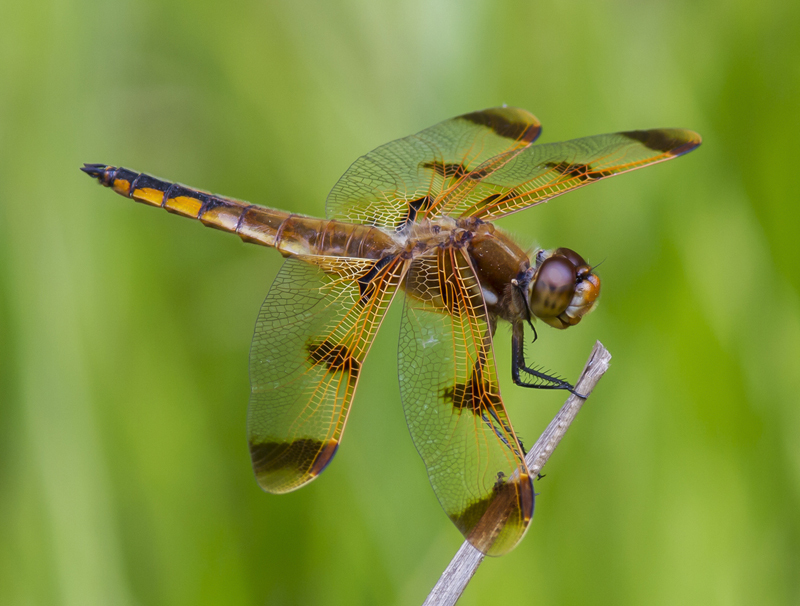 Because of their flashy wing pattern -- males and females look almost alike -- individuals are easily noticed, even by beginners or casual observers. Comment: Orange, 2013-04-27, Eno River State Park. Fews Ford section, power line cut west of maintenance area. - Male.